California water officials are poised to approve a revolutionary plan that could redefine the way water is allocated. At stake are the state's oldest water rights, known as “senior rights,” which have long been seen as untouchable, and that includes San Francisco's. For a century, San Francisco has enjoyed a pristine source of water, dodging the shortages others have faced during California’s chronic water wars. Now, as key rivers continue a downward ecological spiral, the city is being pulled into the fray. The state plan has sparked a fierce debate. Environmental groups say it doesn’t go far enough to save imperiled salmon. San Francisco doesn’t agree and it’s allied itself with some unexpected bedfellows: conservative agricultural districts in the Central Valley. That might be surprising for San Francisco, known for its a solar-powered, food-composting climate-friendly reputation. Yet when it comes to water, some say the city is lagging behind others that are on the leading edge of reusing and recycling their supplies. Like most California cities, San Francisco gets the majority of its from far beyond its borders; in this case, it's 150 miles away in Yosemite National Park. 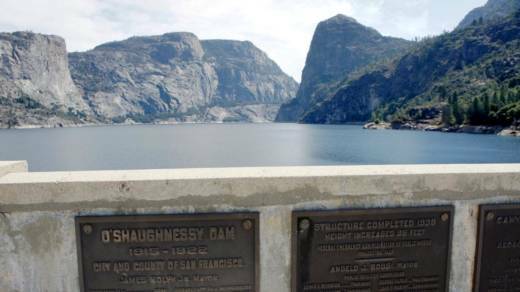 That’s where Hetch Hetchy Reservoir traps snowmelt that feeds the Tuolumne River. From there, the water flows through a chain of reservoirs and pipelines that carry it directly to San Francisco. It also supplies much of the Bay Area. About 2.7 million people from Alameda County to Silicon Valley rely on it as well. San Francisco’s right to the water goes back to 1901, when leaders in the booming city were desperately searching for a new supply. As the story goes, the claim was tacked to an 8-inch diameter oak tree on a riverbank. 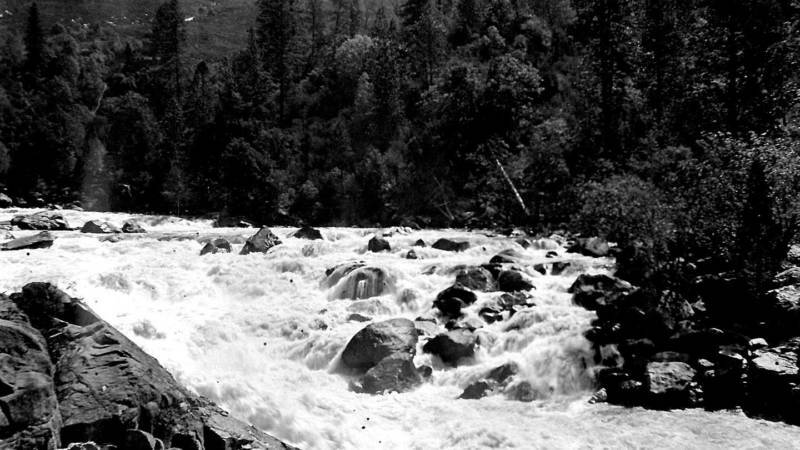 “When you filed for water rights, you basically had to post a notice where you proposed to divert water from," explains Steve Ritchie, assistant general manager at the San Francisco Public Utilities Commission, "which in effect was filing a piece of paper to a tree that was hanging over the Tuolumne River." 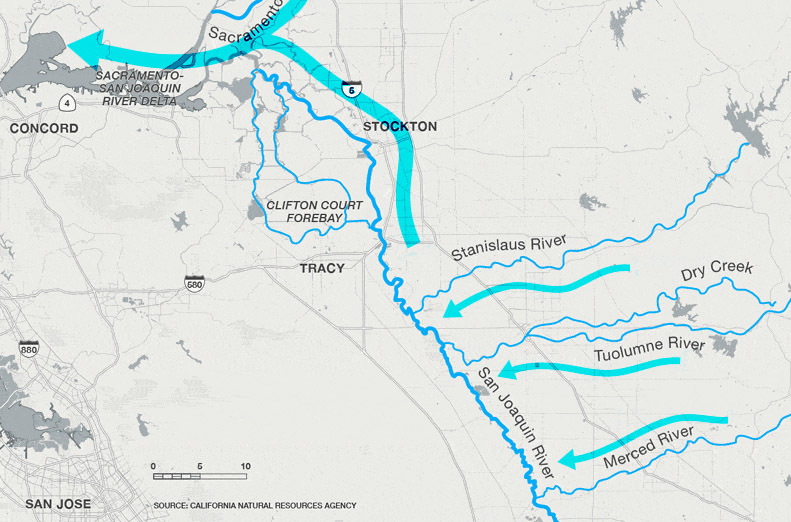 Following its natural course, water in the Tuolumne flows into the Sacramento-San Joaquin Delta, the great nexus of California’s supply and the trenches of the fiercest battles over water. By sinking a straw into the Tuolumne to take out water far upstream of the Delta, San Francisco has avoided those fights. “San Francisco has been able to stay out of the water wars because the San Francisco system is separate from other systems,” says Ritchie. Now, the ecological crisis in the Delta has gotten so bad, the water wars are reaching all the way upstream. Before it gets to the Delta, the Tuolumne joins up with the San Joaquin, a major river that often runs completely dry. Chinook salmon, the species that fishermen catch in the Pacific Ocean, must return to California’s rivers to reproduce and lay their eggs. In 1984, about 70,000 Chinook returned to the San Joaquin River basin. By 2014, it was down to 8,000. California is required by federal law to regulate water quality in the Delta. The Bay-Delta Water Quality Control Plan, as it’s known, was last updated more than 20 years ago. Now, the State Water Resources Control Board has put together a new plan that attempts to balance both the health of the environment and the needs of farms and cities. The plan marks a new approach to how the Delta would be managed. Traditionally, protecting water quality and endangered species there has fallen to a few water users that have major pumping infrastructure in the Delta. They're the ones who've faced cutbacks when water quality has degraded. But in 2009, California lawmakers passed legislation requiring agencies to look at upstream river flows or “flow criteria.” It’s a more holistic approach, looking at the entire watershed. 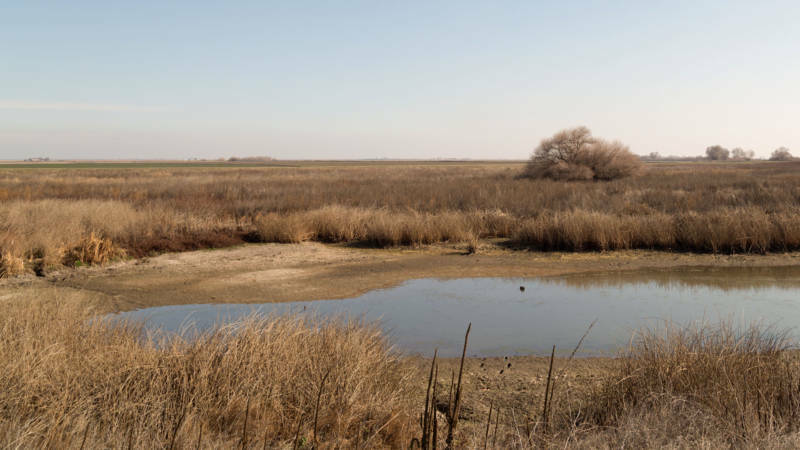 A scientific report that followed passage of the law, recommended restoring a natural springtime surge of water to help both the San Joaquin River and the Delta ecosystem. On the San Joaquin, the report concluded that the ecosystem needs 60 percent of “unimpaired flow,” meaning the flow that would naturally go down the river if humans weren’t siphoning off water along the way. The state water board considered that number, but also is charged with balancing it with the needs of farms and cities. In a final draft plan released this year, the water board proposed returning 40 percent of the unimpaired flow to the San Joaquin and three of its tributaries: the Tuolumne, Stanislaus and Merced Rivers. The flows could fluctuate within a flexible range of 30 to 50 percent. Currently, flows range from 21 to 40 percent on average. The numbers disappointed environmental groups, which argued the science supported higher flow in the river. It also disappointed the water districts faced with giving up some of their water, including San Francisco. Even with its senior water rights, San Francisco has found itself, for the first time, at the bottom of the food chain. On the Tuolumne River, the two other major water users, the Turlock Irrigation District and the Merced Irrigation District, have even earlier water rights, making them more senior. In California, the doctrine is generally “first in time, first in right,” so San Francisco would be facing cutbacks before those rural districts do. In wet years, there would be plenty of water. But with the Bay Area growing, SFPUC predicts the cuts would mean rationing during droughts and billions of dollars of economic impact, though state board staff have challenged those numbers. During the last drought, SFPUC’s customers conserved about 13 percent compared to pre-drought water use. Ritchie says to get deeper cuts, commercial and industrial customers would have to cut back. As SFPUC and other water districts filed increasingly alarmed comments on the proposed plan, the state board had a response: Get creative. “Water users can adapt by switching crops, become more efficient, and putting more water away in wet or normal times for the inevitable dry times,” says Marcus. That’s been common in some Southern California cities, which have led the way in water recycling, conservation and capturing storm water runoff for reuse. San Francisco has been a bit late to the party. 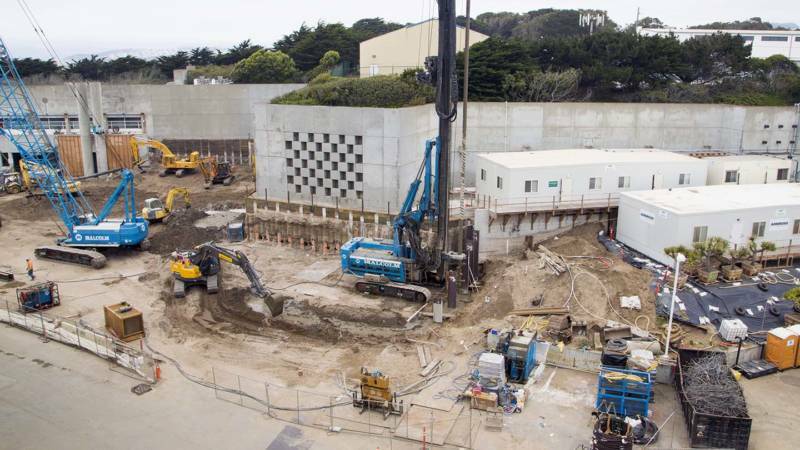 Last year, SFPUC broke ground on its first water recycling project. The Westside Enhanced Water Recycling Project will clean up wastewater and use it to irrigate Golden Gate Park and local golf courses. Other cities have already taken water recycling to the next level. Orange County and San Jose treat some of their wastewater to drinking water quality so it can be added back to the area’s water supply. Ritchie says SFPUC is in very early conversations for a similar project, but they take time. Today, San Francisco residents use less water than average Californians do, thanks to a cool climate and the city's lack of expansive lawns. Other parts of the Bay Area that use SFPUC’s water have higher water use. Still, San Francisco has a groundbreaking water efficiency policy, passed in 2012. New buildings of 250,000 square feet or more must have “on-site reuse systems,” which could include recycling potable water and using it a second time to flush toilets. Ritchie says SFPUC tried it during the last drought, but was unsuccessful in finding farmers willing to sell. Several other California water districts were able complete water transfer deals. During a long-term drought, the SFPUC could buy water from an irrigation district at a price that would compensate farmers, laborers, processors and distributors for what they would have made -- but without having to do any work, and at a price lower than what the SFPUC charges its wholesale customers. Following the nearly inevitable course of water battles in California, the water board’s plan is likely headed to court. Asked whether San Francisco will be in line at the courthouse steps if the plan is formally adopted, Ritchie doesn't shrink from the question. “Yeah, that’s a very real possibility because the consequences are so great,” he replies. To avoid that, the water board has repeatedly asked for a deal to be struck. Water users, including SFPUC, could come up with a different plan that includes strategies to help salmon and other fish, like restoring floodplain habitat. Despite several years of negotiations, a deal still isn’t on the table. SFPUC has argued that the “unimpaired flow” approach -- leaving more water in the Tuolumne River -- isn’t necessary and that restoration and other projects should be enough. State officials and biologists, so far, haven’t agreed. The state water board delayed its final vote on the plan and will be taking more comments on Tuesday. Whichever way it goes, it could be a wake-up call for San Francisco, which is now facing the same water-strapped realities as the rest of California. “The future is challenging no matter what happens,” Ritchie says.